Router username and password is required to reset the router or to change router settings. Different models of router has different default username and passwords. If you are not sure about default login details of your router then head over to Router Passwords. 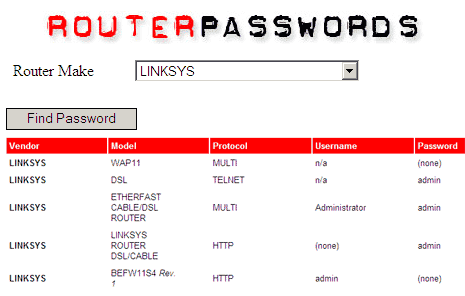 It has database of default username and password of different models of routers. To get started, just select the router make or model and click on find password button. You will get list of related username and password for the selected router make or model. Bookmark Router password [via] and you can afford to forget default login details for time being!